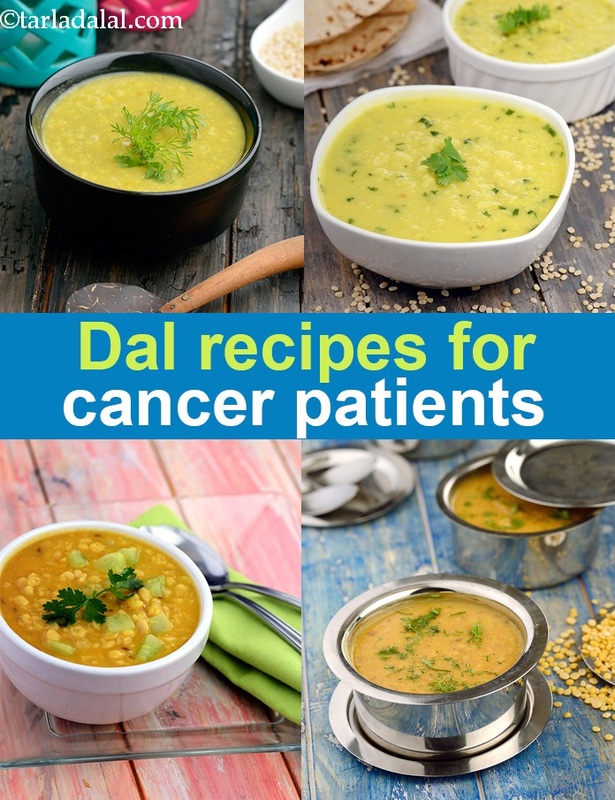 Dal Recipes for Cancer Patients, Healthy Veg Dal Recipes for Cancer. Dals are wonderful sources of protein and iron. Protein helps in building new cells and repairs the wear-and-tear of your body cells, while iron is required for the formation of haemoglobin, which plays a key role in supplying oxygen and nutrients to cells. These two are like the pillars of cell health. So, make sure you include sufficient dals, in tasty forms. Rely on dals, which are non-greasy and non-spicy. These are the most soothing. They are best if you have some mouth sores as well. You have a lot to explore - from simple Bengali Style Dal Kalai , which makes use of cooling fennels seeds to Dahiwali Toovar Dal which is spiced with small quantities of basic masalas. Well, you can adjust the spice according to your taste. Why not think of adding some veggies too to your dals. They are a good source of antioxidants, which are of utmost importance to fight the disease and cancer cells. To make up for your protein, be a little creative and combine all the dals and toss in some lycopene rich tomatoes and gingerol rich ginger to create a delicious Mixed Dal. Well that’s not it. Greens can be added to dals as well. Explore a variety of greens like iron rich chawli leaves, vitamin A rich spinach leaves to make Palak Masoor Dal and other vegetables like fiber rich cluster beans to whip up Gavar aur Masoor ki Dal and water-filled cucumber to cook healthy and nutritious Chana Dal with Cucumber. Accompany these dals with whole-wheat pulkas or with Paushtic Roti or Oats Roti to make nourishing meal combos. Avoid refined flour, also called maida, as it’s not a good source of most nutrients. Enjoy our Dal Recipes for Cancer Patients, Healthy Veg Dal Recipes for Cancer and other cancer recipe articles below.